1. Ease. Most of you are busy, and training time is precious. Therefore, it's really tough to find the time to train for a half-marathon or marathon. Not so with the 5K. You can work up to it quickly (from scratch) and train for it adequately on just three days a week. 2. Convenience. With a 5K, race day is a snap. You arrive at the race, warm up for 10 to 20 minutes, race for 40 minutes maximum, cool down, replenish with food and drink, and head home in your new race T-shirt before your family has finished breakfast. 3. Exhilaration. In a 5K, you feel like you're really racing. And that's a good feeling. 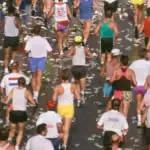 Not many runners can maintain a 10K race pace that is much faster than their daily training pace. With a 5K, however, you can motor as much as one minute per mile faster than your usual training pace. 4. Improvement. Racing the occasional 5K is an excellent fitness booster. It will elevate your max VO2, improve form and efficiency, and make your regular training runs feel easier. 5. Change. Too often in our training, we run the same course at the same pace at the same time of day. Don't get me wrong. Routine is good—essential, in fact, if you want to stay with a long-term running program. But too much of a good thing is too much of a good thing. You need variation, and a short-and-sweet 5K every once in awhile is a great way to mix things up. 6. Motivation. Races are great motivators. Each year, scores of runners tell me that having a regular schedule of 5K races gets them out the door on days when they would have stayed in bed in the morning or hit the couch after work.